Jamie Cureton opened his account for Exeter with two goals to beat 10-man Yeovil in the Johnstone's Paint Trophy. The striker beat Adam Virgo to a long ball before firing past John Sullivan to put the Grecians ahead. Yeovil's Sam Williams was then sent off for headbutting Troy Archibald-Henville but they equalised when Andrew Welsh fired past Paul Jones. However, Exeter hit back when Cureton turned home Jake Thomson's cross before Ryan Harley floated in a free-kick. "We're exactly where we were last season with the same amount of points and knocked out of both cups in quick succession and I'm disappointed because I think we've got a better squad. "Silly decisions and sloppy goals have cost us tonight and that's something we've got to learn from. "We're now without Sam Williams for three games for a piece of stupidity and now other people are going to get their chance." 90:00+4:47 The referee ends the match. 90:00+3:43 Jamie Cureton is ruled offside. John Sullivan restarts play with the free kick. 90:00+3:22 Ryan Harley decides to take the corner short. 90:00+1:06 GOAL - Ryan Harley:Yeovil 1 - 3 Exeter Ryan Harley finds the net with a goal direct from the free kick from outside the penalty box to the top left corner of the goal. Yeovil 1-3 Exeter. 90:00+0:25 Booking Paul Huntington goes into the book for unsporting behaviour. 88:59 Paul Huntington gives away a free kick for an unfair challenge on Liam Sercombe. 86:28 Ryan Harley has a shot on goal from outside the area which misses right. 85:43 Andrew Welsh crosses the ball, Rob Edwards manages to make a clearance. 84:56 The ball is crossed by Jamie Cureton. 84:32 Free kick awarded for an unfair challenge on Jake Thomson by Andrew Welsh. Richard Duffy takes the free kick. 82:42 Substitution Cameron Stewart leaves the field to be replaced by Luke Freeman. 80:28 Jamie Cureton crosses the ball, save made by John Sullivan. 77:58 Assist by Richard Logan. 77:58 GOAL - Jamie Cureton:Yeovil 1 - 2 Exeter Jamie Cureton finds the net with a goal from close in to the bottom right corner of the goal. Yeovil 1-2 Exeter. 75:25 GOAL - Andrew Welsh:Yeovil 1 - 1 Exeter Andrew Welsh gets on the score sheet with a goal from deep inside the penalty box to the bottom left corner of the goal. Yeovil 1-1 Exeter. 74:37 Free kick awarded for a foul by Richard Logan on Adam Virgo. John Sullivan takes the free kick. 73:40 Inswinging corner taken right-footed by Ryan Harley from the right by-line, Close range header by Richard Logan misses to the right of the target. 72:44 Outswinging corner taken from the right by-line by Ryan Harley. 72:07 Shot by Richard Logan from deep inside the penalty area misses to the right of the target. 71:35 Outswinging corner taken by Cameron Stewart. 68:02 Dean Bowditch produces a right-footed shot from just outside the box that misses to the right of the target. 65:29 Foul by Scott Golbourne on Andrew Welsh, free kick awarded. Shot on goal comes in from Andrew Welsh from the free kick. 64:41 Outswinging corner taken by Ryan Harley, clearance made by Nathan Smith. 60:39 Substitution Luke Ayling replaces JP Kalala. 60:39 Jamie Cureton is caught offside. John Sullivan takes the free kick. 58:16 The ball is sent over by Nathan Smith. 57:14 Andrew Welsh takes a shot. Save by Paul Jones. 56:03 The referee blows for offside against Jamie Cureton. John Sullivan restarts play with the free kick. 54:27 Centre by Jake Thomson, save by John Sullivan. 51:51 Substitution Billy Jones goes off and Rob Edwards comes on. 51:51 Substitution Jake Thomson replaces Troy Archibald-Henville. 51:51 Foul by Paul Huntington on Jamie Cureton, free kick awarded. Free kick taken by Ryan Harley. 50:22 Steve Tully gives away a free kick for an unfair challenge on Cameron Stewart. Free kick crossed left-footed by Andrew Welsh from left wing, clearance by Troy Archibald-Henville. 49:07 Liam Sercombe gives away a free kick for an unfair challenge on JP Kalala. Direct free kick taken by Craig Alcock. 47:55 Scott Golbourne produces a cross, Adam Virgo makes a clearance. 47:07 Short corner worked by Andrew Welsh. 46:52 Effort on goal by Owain Tudur Jones from just outside the area goes harmlessly over the target. 45:40 Free kick awarded for an unfair challenge on Dean Bowditch by Troy Archibald-Henville. Paul Huntington restarts play with the free kick. 45:00+3:35 The referee blows for half time. 45:00+2:57 The ball is crossed by Andrew Welsh, Craig Alcock has a headed effort at goal from close range which goes wide of the left-hand post. Correction - 44:49 Booking Troy Archibald-Henville is given a yellow card. 44:49 Booking Richard Logan goes into the book. 44:09 Sent off Red card for Sam Williams. 42:52 Outswinging corner taken left-footed by Andrew Welsh from the left by-line, Paul Jones makes a save. 41:20 Troy Archibald-Henville concedes a free kick for a foul on Dean Bowditch. Owain Tudur Jones fires a strike on goal direct from the free kick. 40:40 Shot on goal by Paul Huntington from inside the box goes harmlessly over the target. 39:40 Foul by Richard Logan on Dean Bowditch, free kick awarded. Cameron Stewart restarts play with the free kick. 35:20 The referee blows for offside. Craig Alcock restarts play with the free kick. 34:06 Outswinging corner taken by Billy Jones. 33:42 Shot from inside the area by Jamie Cureton clears the bar. 31:32 James Dunne gives away a free kick for an unfair challenge on JP Kalala. Free kick taken by JP Kalala. 28:58 Free kick awarded for a foul by Sam Williams on Ryan Harley. Ryan Harley takes the free kick. 26:27 The ball is crossed by JP Kalala, Steve Tully makes a clearance. 25:54 Cameron Stewart takes the outswinging corner, clearance by James Dunne. 25:15 Booking Scott Golbourne receives a caution. 25:02 Free kick awarded for a foul by Scott Golbourne on Andrew Welsh. Direct free kick taken by Cameron Stewart. 24:29 Liam Sercombe produces a right-footed shot from outside the penalty box and misses left. 21:08 Jamie Cureton takes a shot. John Sullivan makes a save. 20:42 Andrew Welsh gives away a free kick for an unfair challenge on Scott Golbourne. Ryan Harley takes the direct free kick. 20:05 The ball is delivered by Scott Golbourne, save by John Sullivan. 18:48 Ryan Harley is flagged offside by the assistant referee. John Sullivan restarts play with the free kick. 18:12 Craig Alcock sends in a cross, clearance by Troy Archibald-Henville. 14:44 Outswinging corner taken left-footed by Andrew Welsh, clearance by Troy Archibald-Henville. 14:07 Paul Jones takes a shot. Save by John Sullivan. 13:08 The assistant referee flags for offside against Andrew Welsh. Troy Archibald-Henville takes the free kick. 9:53 Ryan Harley provided the assist for the goal. 9:53 GOAL - Jamie Cureton:Yeovil 0 - 1 Exeter A goal is scored by Jamie Cureton from close range to the bottom left corner of the goal. 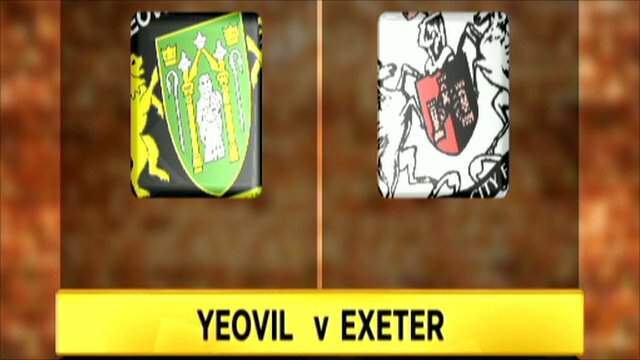 Yeovil 0-1 Exeter. 8:55 Corner taken left-footed by Andrew Welsh, Headed effort from deep inside the area by Sam Williams misses to the right of the goal. 8:30 Corner taken left-footed by Andrew Welsh, Troy Archibald-Henville makes a clearance. 8:03 Centre by Craig Alcock, Owain Tudur Jones takes a shot. Clearance by Paul Jones. 7:27 Sam Williams has an effort at goal from outside the penalty box which goes wide right of the target. 4:06 The ball is delivered by Andrew Welsh, Shot from deep inside the area by Cameron Stewart clears the bar. 3:36 The offside flag is raised against Richard Logan. Direct free kick taken by John Sullivan. 1:30 Scott Golbourne produces a cross.